Organza is one of the most sheer and lightweight dress fabrics. A more transparent sheer fabric than chiffon, but stiffer with a crisp handle, adding greater volume to skirts. It is a popular wedding dress fabric, used for overlays or over-skirts in bridal wear, also on prom dresses, evening gowns, cocktail and other special occasion dresses. Different types have varying degrees of sheen, sparkle, or gloss. 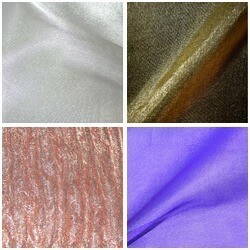 From lower cost polyesters, to pure silk, and mixes with metallic or lurex yarns. With two-tone colours, also called 'shot' or 'changeant', the colours subtly change as the fabric moves.